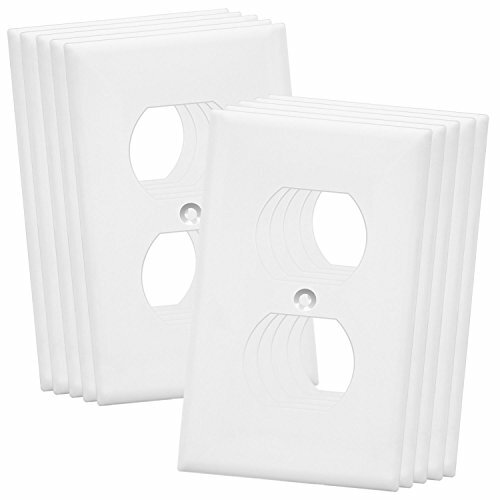 Enerlites line of unbreakable polycarbonate wall plates are designed to fit a wide range of applications such as duplex receptacles, toggle light switches, decorator switches, in-wall motion sensors, rotary dimmers, humidity sensors, rocker switches, GFCI outlets, and blank device covers. Enerlites wall plates come in size options of standard, mid-size, and over-size with configurations of 1-gang, 2-gang, 3-gang, 4-gang, 5-gang, and 6-gang applications. These wall plates are manufactured to provide optimum durability, flexibility, and resilience to bending and high-impacts. Their smooth finish provides an attractive look and makes them easy to clean. Enerlites plastic wall plates are available in four colors: white, black, ivory, and light almond.